Time to explore a new city! I had some fruit for breakfast, then headed out. I’m staying right in the middle of the old colonial town. One block from the main shopping pedestrian street (Calle del Conde). Lots of souvenir shops, cafes, restaurants, and the amazing supermarket. Right at the eastern end of this street is Calle los damas. The oldest street in the Americas. 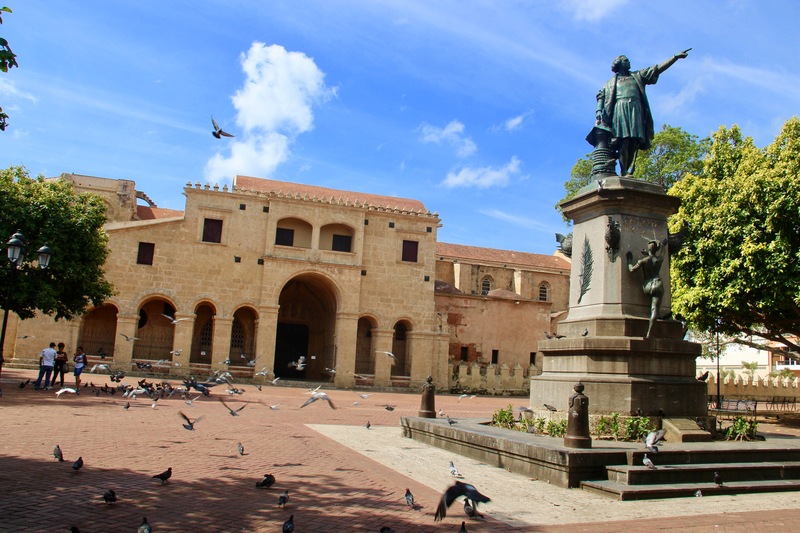 And also the Cathedral – the oldest cathedral in the Americas, where construction began in 1514. It was a sandy colour, with really intricate carvings on the front. A very boxy shaped building. And unlike any church I’ve ever seen before. But sadly it wasn’t open. Maybe tomorrow. Just north of the park which has the cathedral was Plaza Espana. This had views down the the river below. City walls. And the Alcazar de Colon, which was once the house of Columbus’ son. I wandered around a few different streets, full of old pretty buildings, colourful flowers and the odd small park dotted around. And then ended up back in the supermarket for more things (!). I got some Zapote, a different melon, more chocolate soy milk (because it was so good) and a few things to take home. I love foreign supermarkets. The vegan place I wanted to go for lunch only had leek and broccoli soup – it’s weird, on Mondays things don’t seem to be open, or do much in Central American / Caribbean. That was a shame. So I just ate some melon and zapote. Then I spent the rest of the afternoon doing nothing. Sitting by and in the pool. I really like this town. On the plane yesterday, the man I was sat next to was stunned that I was going to visit Santo Domingo. And more that I was a white girl, by myself. He was under the impression it was completely unsafe and corrupt. Perhaps it is. But I haven’t seen any of that at all. I haven’t had any hassle at all. Some people have come up to me, but a simple ‘no gracias’ and they leave me alone. There are a few tourists around, all the locals are friendly and it doesn’t feel unsafe. For dinner, I went back to the same place as yesterday. It was just too good. This time I sat inside. Well. Outside. Their whole dining area is an outdoor courtyard and is so cute – full of trees and lanterns. I had a selection of different things – falafel, hummus, aubergine and pitta bread. Time to go home already. Holidays pass so quickly. In the morning I went back to the church which was closed yesterday. And today it was open. D$60 to enter (£1). And it was so cold inside. The roof was high and had carved arches. All around the walls were small vestibule areas with statues and paintings. It was nice. And I was the only one inside, which was great. On the way back, I popped into the supermarket (again) for some final bits and pieces. And then did nothing for a few hours, before heading back to the airport at 1pm. It was sunny. Then thunderstorm. Then sunny again. Odd. Despite vowing to never fly Iberia again, here I am, flying with Iberia again. It was the only sensible route home. But not a sensible check in. Before allowing you to join the queue, there were women checking passports. And taking ages doing so. Which meant that there was a queue half the length of the airport. Once I had finally checked my bag, the next queue; some random passport check, which again was so slow. Then joining bag scanning. Which was a long queue. And the women were so rude. Obviously I got stopped (I always get stopped because of my dive equipment) and she was throwing my stuff around, which I was not impressed with. And told her. Probably didn’t help my case. Then passport stamping. But somewhere enroute I should have been given a piece of paper to fill out. I wasn’t. So the passport man gave me one and I had to queue again. Such a joke. After arriving about 3.5 hours ahead of the flight time, I now only had about an hour until boarding. It’s a 7 hour flight to Madrid. Surprisingly short. Use this link https://www.booking.com/s/06f2aaeb next time you’re booking a trip or somewhere to stay, and you’ll get a £10 reward. Booking.com will credit you once you stay anywhere in the world.